There's a web site, Tufton or Death, where campaigners are trying to save the lives of people that use a turn-off on the A34 "Chievley Services" Road. 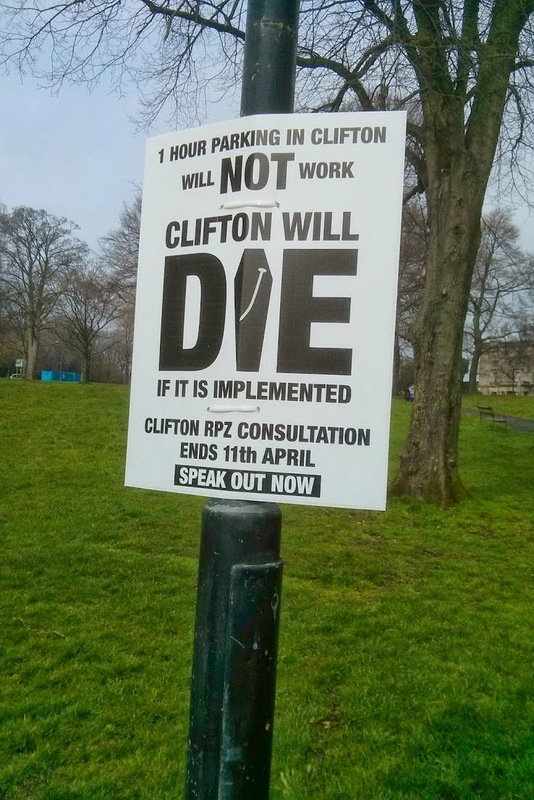 This is relevant, as some Cliftonians are now campaigning about their RPZ plans, with signs round the area placed perfectly at eye-level for anyone driving a little urban 4x4 -meaning exactly the kind of people that Clifton depends on. Anyway, interesting to see the signs. In today's BBC Radio 4 Costing the Earth program we got to hear a someone describe the residents of Clifton as "In the driving seat". That was not a metaphor: it is a statement of fact. Imposing time limits on parking in Clifton is either going to force residents to walk a bit, or destroy the village the way it did to Southville. We shall have to see what the outcome is. Of course, Southville tried to address the problem by adding bike parking -something Clifton has strongly resist on the basis that it is out of keeping with the area. Is the RPZ plan a first step to forcing Clifton Village to actually have bike parking? Meanwhile, keep an eye on what happens here. What's impressive is that someone had the money to print some nice posters. Elsewhere in the city the protests were limited to bits of paper run off home printers. This though -professional. A comment arrives on our Never park up the inside of an HGV post. I'M ACTUALLY AMAZED AND VERY ANNOYED THAT YOU CAN DO SUCH THING AND USE PHOTOGRAPHS THAT ARE NOT YOURS AND USE THEM AT YOUR WILL TO ILLUSTRATE YOUR POINT.THIS VEHICLE WAS MINE AND WAS PARKED (NO ONE WAS IN IT) LEGALLY ON THE ROAD AND THE DRIVER HIT MY CAR WITH THE BACK OF HIS LORRY.I WON THE CASE WITH THE INSURANCE (OBVIOUSLY) AND HAD 3 WITNESSES TO CONFIRM THE INCIDENT.INSTEAD OF TALKING COMPLETE NONSENSE YOU SHOULD CHECK THE ACCURACY OF YOUR FACTS MR SO CALLED BLOGGER. THE FACT IS THAT OVERSIZE LORRIES SHOULD NOT BE ALLOWED TO ENTER SUCH NARROW AND TIGHT ROAD AS THEY'VE CAUSED SEVERAL INCIDENTS OF THE SAME NATURE IN THAT STREET.I HOPE YOU'LL HAVE THE DIGNITY TO PUBLISH MY COMMENT AND DIFFUSE THE REAL INFORMATION AND NOT WHAT SUITS BEST YOUR CASE. THE TRUTH IS THE TRUTH NO MATTER WHAT YOU MAY THINK OF IT. Well, where do we begin? You are correct, we have no idea what we are talking about. The right to talk complete nonsense is a fundamental aspect of press freedom. One of our reporters pedalled past about 09:00 that morning, at which point the cardboard wasn't there, just a rear hatch that looked like it had be ripped off. Given the fairly distraught woman nearby, they chose to continue & not take pics. It was on the way back from work that this photo was taken. Taken: 13/feb/2012 at 16:40, ISO 200 f/3.3, 1/30s, 25mm, Manual white balance: cloudy. The full resolution pics are 4000x3000 if you want them. how a war-on-motoring city tries to stop HGVs getting to Clifton. How trying to drive round Bristol in an HGV is a stressful job. Now, we do recognise your complaint about narrow roads being unsuited to HGVs -but you have to recognise that in a modern society, HGVs need to be able to drive down every road in the city. How else can they deliver pre-prepared salad to the Tesco corner shop of Clifton if they can't park on double yellow lines and zebra crossings? How else can they deliver cheese to the Tesco "flammable" express of Cheltenham Road if they can't park in the bike lane? How else can they park at an empty dual carriageway except on the shared use pavement? We're afraid that you'll just have to accept that losing 1-2 cars a week to passing HGVs is the price of living near the Miner's Arms and Farm pubs. We'll take submissions of other incidents, and you get to retain copyright of your images. In the mean time, please enjoy the rest of our site.